Lawn Mowing Boise - Lawn Care in Boise Idaho. Boise Lawn Experts is passionate about lawns and mowing them properly. As you can imagine we got started with the goal to make every lawn as beautiful healthy and vibrant as possible. Lawn Mowing plays a big role in the health and the curb appeal of your lawn. Our lawn care technicians are highly experienced in lawn mowing not only for appeal but for health. Mowing you lawn isn't rocket science but can be strenuous and time consuming. Simply knowing the proper length and direction of your cut can help. However, our technicians know this and much more such as the health and the needs off your lawn. The thickness of the thatch, which may mean its time to Aerate your yard. Plus the skill and experience in our Lawn Care Experts allows for the best possible lawn, with zero sweat equity! How short should you mow your lawn? That's a great question and there are a few variables in every situation. For an estimate give us a call here. As a general rule you shouldn't cut more than 1/3 of the grass length. However, there are multiple types of grass and some are optimal at 1.5" and some shorter. One thing you want to avoid is mowing your lawn too short. This can serious effect the health or your lawn and possibly the appearance of the lawn. 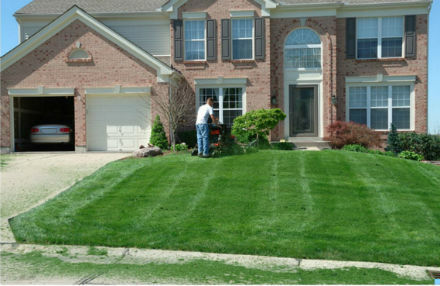 We approach every job with enthusiasm and if you simply need your lawn mowed, we can do that as a stand alone service. Boise Lawn Experts the areas most passionate lawn care services and is glad to help with jobs big or small, residential or commercial.